As I crisscross the RCSD, I am reminded daily how our schools are rich repositories of local history. 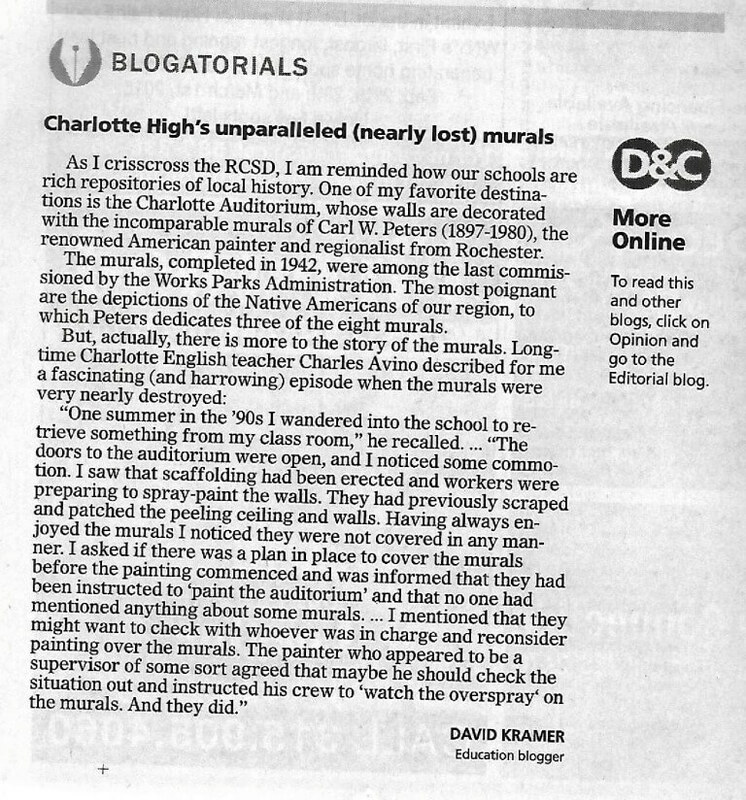 One of my favorite destinations is the Charlotte Auditorium whose walls are decorated with the incomparable murals of Carl W. Peters (1897 – 1980), the renowned American Scene Painter and Regionalist from Rochester. 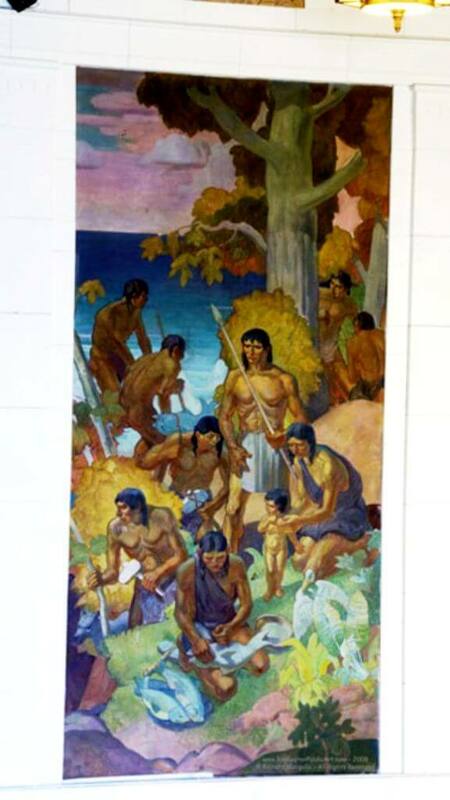 The murals, completed in 1942, were amongst the last commissioned by the Works Progress Administration. They capture the Progressive tenor of the WPA, in which average Americans are coming together to build a democratic America. 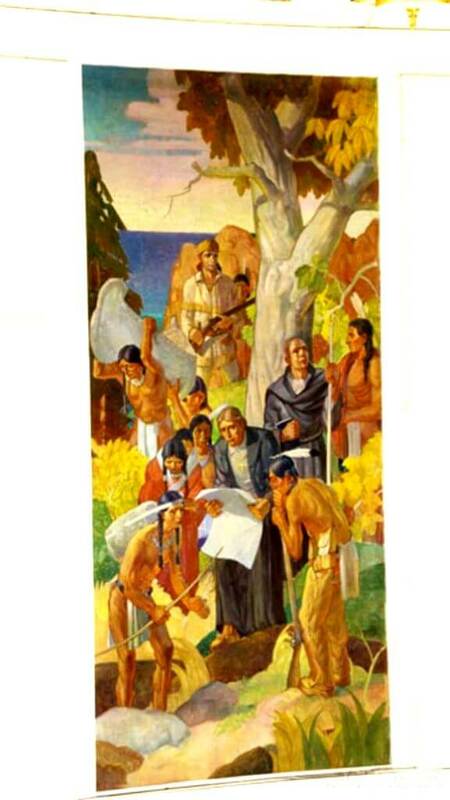 The most poignant are the depictions of the Native Americans of our region to which Peters dedicates three of the eight murals. In the first two, the tribesman are presented as peaceful stewards of nature. Then a missionary appears, as well as a white settler with a gun. Finally, the French Governor Denonville’s Army arrives, cast against but two downtrodden Indians. 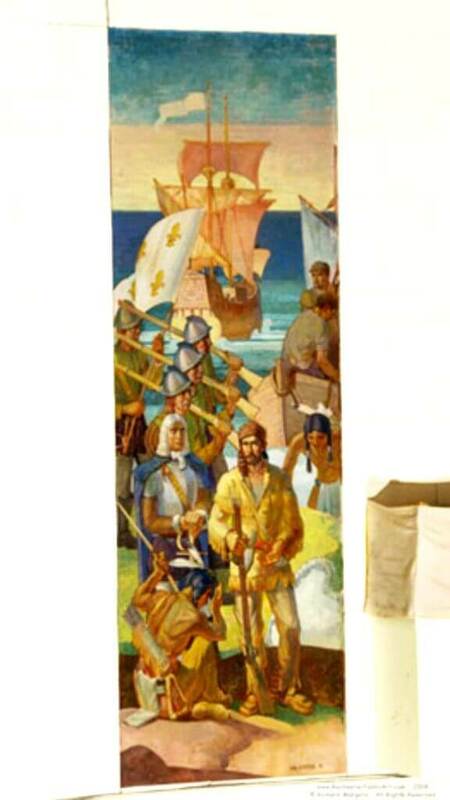 In the remaining murals, the Native Americans are entirely vanished. Powerful social commentary from a painter most known for bucolic and charming landscapes. One summer in the 90′s I wandered into the school to retrieve something from my class room. As usual, there was much action and disarray: desks, tables and chairs were piled in the halls as the custodians were cleaning the rooms. The doors to the auditorium were open, and I noticed some commotion. I saw that scaffolding had been erected and workers were preparing to spray paint the walls. They had previously scraped and patched the peeling ceiling and walls. Having always enjoyed the murals I noticed they were not covered in any manner. 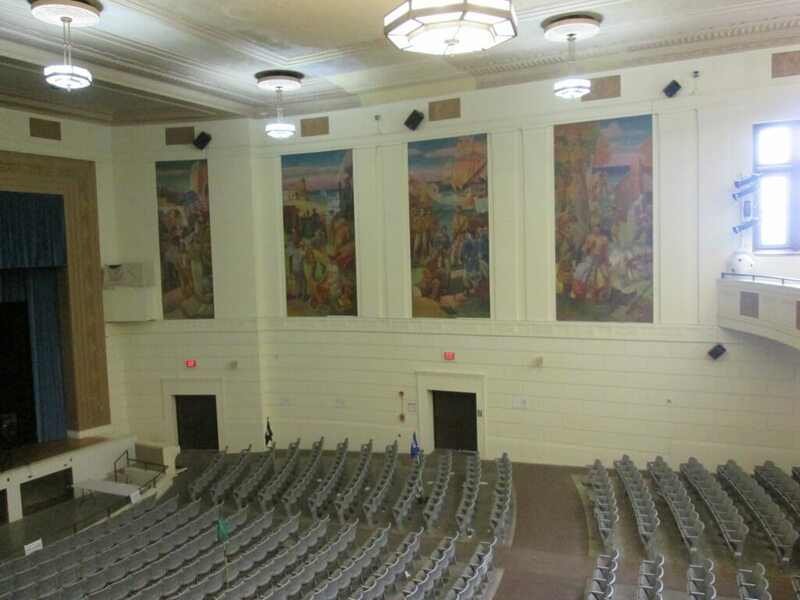 I asked if there was a plan in place to cover the murals before the painting commenced and was informed that they had been instructed to “paint the auditorium” and that no one had mentioned anything about some murals. 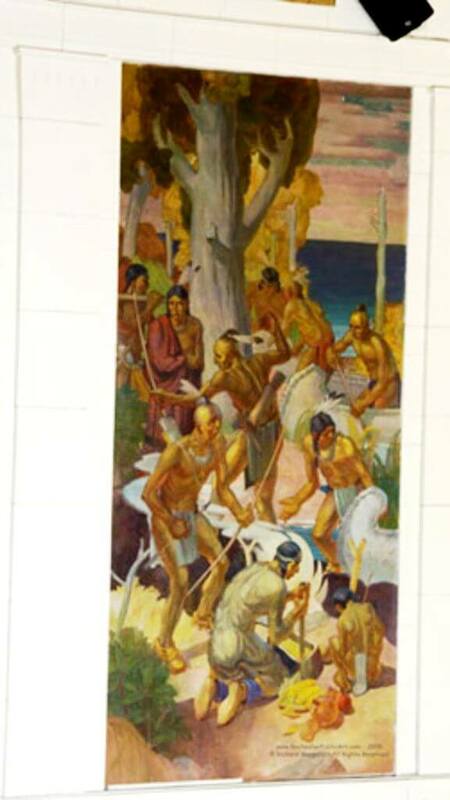 I explained that the murals were created by WPA artists during the 1930′s and that they were essentially irreplaceable. The painters, who were mostly young guys, just shrugged as to imply “so what?” I again mentioned that they might want to check with whoever was in charge and reconsider painting over the murals. The painter who appeared to be a supervisor of some sort agreed that maybe he should check the situation out and instructed his crew to “watch the overspray” on the murals. And they did. For more on war plaques throughout the RCSD Remembering the fallen of the RCSD from America’s past wars For more on Charlotte “See Your Future Experience:” RIT and Charlotte complete innovative mentor program.